"My uncle was an excellent cook – he did most of the cooking in his family and he wouldn’t accept anything less than perfection. His favourite recipe was Laab Turkey, and his trick was to deep-fry all the ingredients (except the meat) until crispy and golden brown. We also raised these turkeys ourselves! 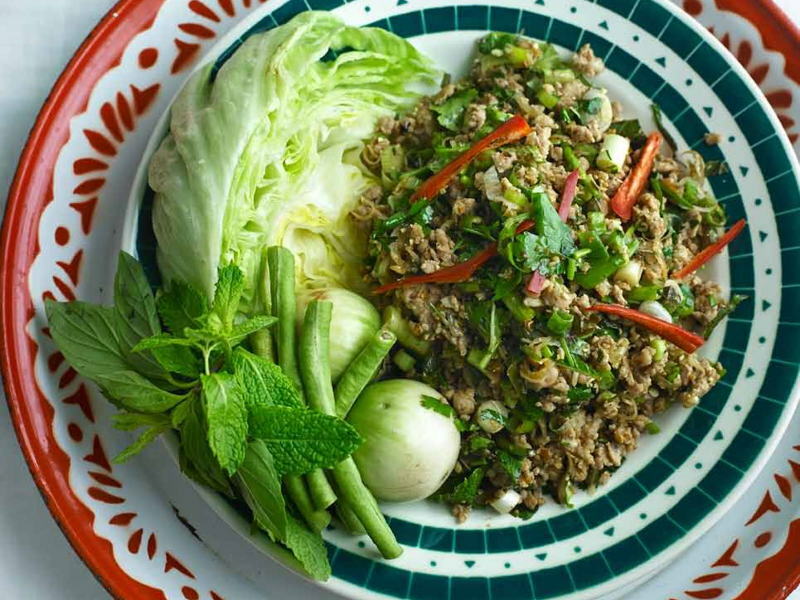 This comes as a surprise to most people as Thai cuisine isn’t necessarily associated with turkey meat. "- Chef Saiphin Moore from Rosa's Thai Cafe. The chilli powder does give the dish an incredible punch, and I think it’s definitely best when it is extra spicy, but you can reduce the quantity to suit your palate. Mix together the chopped garlic, shallots, galangal and lemongrass in a bowl. Place the oil in a wok set over a high heat until it is extremely hot. Add the garlic mixture and stir-fry for about 2–3 minutes until golden brown. Add the minced turkey and continue to stir-fry for about 2 minutes until the meat is cooked through. Take the wok off the heat and add the chilli powder, salt, lime juice, fish sauce, roasted rice and the lime leaf. Stir in the coriander, mint and spring onion. Mix well and taste – it should have a delicious balance of spicy, sour and salty. Serve with lettuce and other fresh green vegetables, sprinkled with chilli slices. The traditional way to eat Laab Turkey is to wrap the hot meat in really cold lettuce leaves. Trust me, it tastes superb this way. The different flavours and temperatures just explode in your mouth!